Arya (Ch. Potiphar Happy Go Lucky of Subsidium) is pregnant! Arya was mated to Pilot (Gr.Ch. Craignair Desert Flyer of Stagmanskop) and she is due on 25 June 2018. 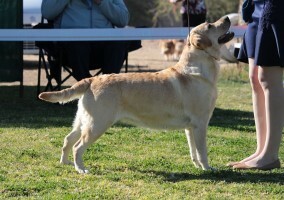 Pilot is the current Victor Ladorum of the Labrador Retiever Kennel Club, so we are hoping some beautiful yellow and black pups! Milly’s puppy Arya (Ch. Potiphar Happy Go Lucky of Subsidium) has returned home to the Potiphar clan when her humans emigrated. We are happy to welcome her back and hope she has a long and happy life with us. Slighty delayed news! Maddy had wonderful litter of 6 pups in December. Beau and her hit it off from the start and Maddy produced probably the most beautiful litter that we have ever seen in the 40 years that we have been breeding. Sally had a litter of 6 beautiful puppies born on 9 July 2017. 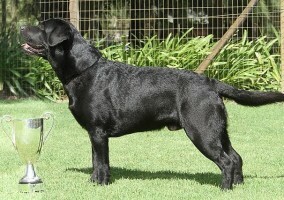 Beau (Potiphar Solo Rio of Stagmanskop) is the sire and is the Runner-up top show dog in South Africa. Its confirmed that Sally is pregnant to Beau and is due mid October. 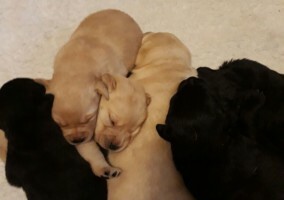 We are looking forward to the litter! 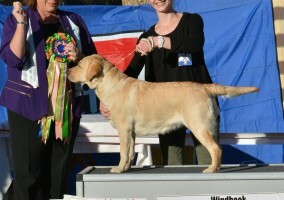 Beau (Potiphar Solo Rio of Stagmanskop) one of Milly’s pups was awarded Best Junior Labrador in South Africa. We are very proud of him! Here he is showing off his trophy. We did a special shoot showcasing Pilot and his two beautiful daughters, namely Charlie and Maddy. We think they make a wonderful photo!